I slept at about 2am last night and this morning I had to wake up very early to get properly dressed up for breakfast at Chef Mickey at 710am. There was a long queue although we went on time but the queue moved pretty quickly. Anyway eventually we were given 90 minutes after we entered. I don't have much comment about the food since I paid for the breakfast here not for the food but for taking pictures with Disney characters. It was nice that the characters were simply going around the restaurant and did not care if they already came to our table earlier. So within that 90 minutes, we got Daisy, Minnie, Donald, Mickey, and then Daisy and Minnie again. With this breakfast basically our Happy 15 Entry was just wasted. Instead of taking the train, we took the shuttle bus from the hotel to Disneysea. Disneysea really feels entirely different from Disneyland. I prefer the more magical Disneyland though. The Aquasphere which is supposed to be an icon of Disneysea is not iconic at all. It looks like a copy of Universal Studios' globe. Anyway as we entered there was already a long queue for photo taking with Minnie in Disneysea costume. Unfortunately Minnie and Mickey were taking turns so by the time my turn came, it was with Mickey. Mickey was also in Disneysea costume so at least I don't have the photo yet. 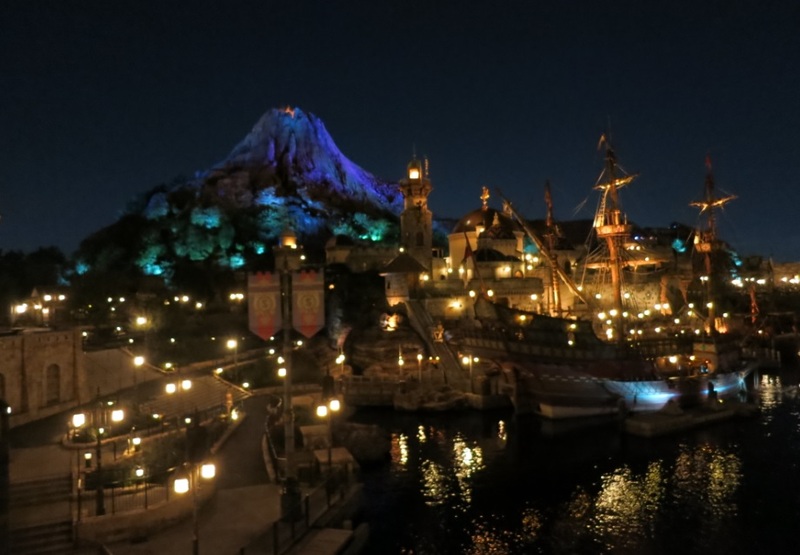 The layout for Disneysea is very similar to Disneyland. 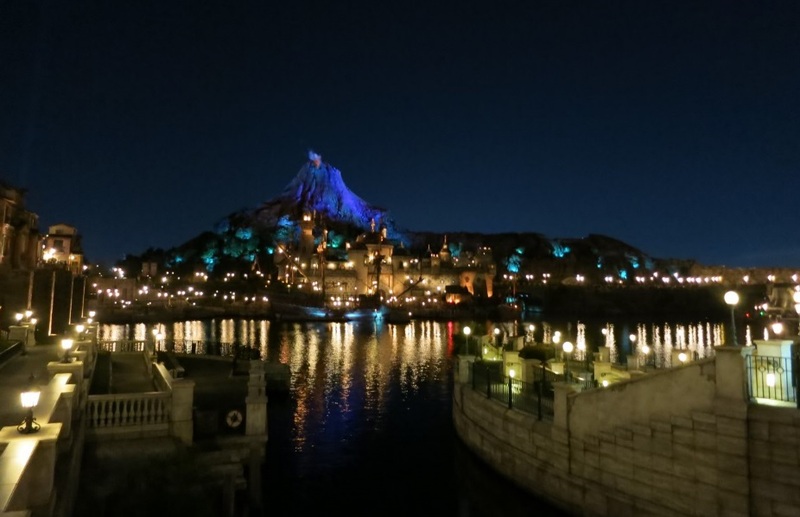 Mount Prometheus is the center of the Disneysea, similar to how Cinderella's Castle is the center of Disneyland. Surrounding this center are the various regions. Although I felt a bit underwhelmed by the Aquasphere, I changed my mind after seeing the Mount Prometheus lol. The whole Disneysea also has some magic as if bringing me to another part of of the world like Venice, Atlantis, Agrabah, America, and so on. Similar to yesterday, taking photos with Disney characters was my main priority and my sister pissed me off again by wanting to take photos with those loitering around. We went for Goofy, Minnie, and Mickey first at the Lost River Delta. The queue for each was about 45-60 mins so in total we spent almost 2.5 hours waiting in open winter air. I had fun with Goofy the most as he suggested really crazy poses. Sadly the end result was not good because instead of raising my arm UP, I raised it backwards so it looked as if I only had 1 arm. Bleah.. In addition to that, when I was checking the photo in my camera, Goofy was playing to tickle my tummy. We were cold and just went to the nearest eatery we found. I don't think under normal circumstances I would eat Mexican rice and pork chop but at the brink of getting cold like yesterday, survival came first. Those kairo/heat pads bought yesterday were not strong enough to fight the cold. Brrr... We continued to Arabian Coasts to see which character would be present for character greetings as it would be random. Sadly it was Stitch so we gave that a miss. Surprisingly this region was really the most crowded. I think partly because the Arabian atmosphere was done really well and people would just take photos with seemingly ordinary items which became unique when they were done in Arabian style. Since we skipped Stitch, we went to Donald. We had about 1 hour before our reserved Big Band Beat show and the queue for Donald was about 45 minutes. It was a gamble that I decided to take lol. I did not look straight at the camera and I was allowed to repeat another photo. With this, we completed all the characters for today. I am not a fan of Duffy and I was not planning to get photo with Duffy. From there, we had rush for the Big Band Beat. It was quite a distant walk and I wanted to pee. Luckily in the end we were not late. Yesterday my sister complaining that I did not reserve ticket for Minnie Oh! Minnie and today I could tell her that I made the correct decision. Big Band Beat is definitely a much better production. It is really like watching a Broadway production and the performers on the stage were performing live (unlike Minnie Oh! Minnie which was obvious that the instrument players were not playing live). The arena is also like a Broadway concert hall. I am not a fan of jazz so while I enjoyed the glam and glitz, I would enjoy it more if they were performing something more Disney-ish. Anyway my sister fell asleep in that comfy concert hall chair. Lol. Anyway it was a great half an hour break from the cold winter air outside. It seemed that I was the greedy one as I was the one constantly initiating meal time. Haha.. So same thing as dinner. This time it was before our body ran out of natural heat. After dinner, we still had plenty of time before Fantasmic! at 8pm. As mentioned above, I am not a fan of Duffy but my sister mentioned Duffy previously. So I asked her again if she still wanted Duffy since we had time to kill. No answer -_-" In the end I was the one who "forced" her with the reason might as well we do it now so that next time there is no need to mention about Duffy anymore. The wait time was 80 minutes and I was okay with that since it would still be too early for Fantasmic!. Anyway they only allowed people to start chope-ing spots only 1 hour before the show. When asking the cast member, we were told that Duffy might be taking a 20 minutes break. Oh my god, we were so lucky because after done taking photo with me, Duffy was taking that break. Heng sia! Duffy looks expressionless in the photo so I do not regret that I am not a fan. I am just taking the photo as a proof that I have been here and done that. After done, we quickly put on layers ready to combat the evening winter cold again for Fantasmic!. We managed to get a prime position too: a corner just behind the string demarcating the reserved area. In front of that corner was plants so essentially there was no human heads covering. Fastasmic! 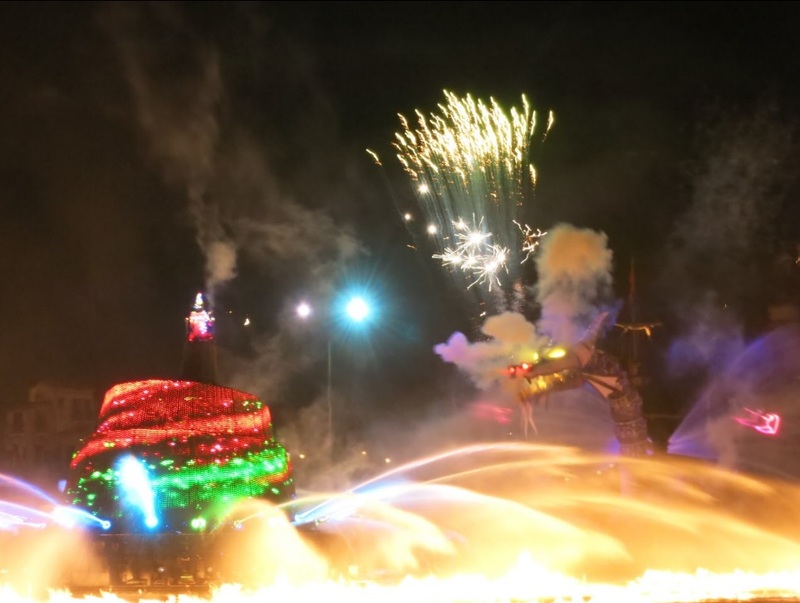 was great but and quite genius to have the show on the water. Unfortunately the distance is too far and everything looks too small from where the people are watching. 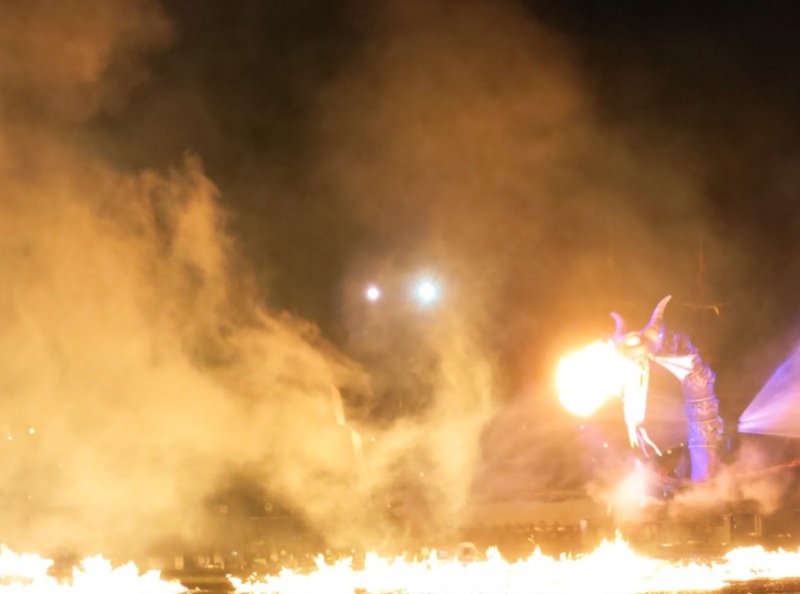 Because of that, I still enjoy Disneyland parades more although this Fantasmic! actually has better effects. Genie is another show stealer here but the most awesome scene was Mickey vs Maleficent Dragon fight. The scheduled fireworks show after Fantasmic! was unfortunately cancelled. We spent the rest of the time exploring the regions we did not manage to visit during the day: Mysterious Island and Mermaid Lagoon. Triton's Castle looks amazing from a far and I was very curious to see it from closer. It looks even more amazing in the evening and the whole Mermaid Lagoon has great decoration to convey the atmosphere. I find it weird that Ariel's Grotto is located outside the Lagoon though. Unexpectedly I bought Rabbit and Owl's plushies from Winnie the Pooh. I am not a fan of Winnie the Pooh but plushies of these 2 characters are rare and hence the decision to buy. We also went back to Arabian Coast as I wanted to buy Aladdin t-shirts. I looked damn fat in this morning photos at Chef Mickey so I wanted to look better for tomorrow. Haha.. I wanted to wear something Disney and unexpectedly there are Aladdin t-shirts. I hesitated to get the black one that was so expensive (4900 yen) but in the end I decided to just YOLO. Of course I bought the small Aladdin and Jasmine plushie keychains that I had been eyeing since the visit to Bon Voyage. After done with shopping, we went to the Magic Lamp Theatre expecting it to be a Aladdin and Genie show. The Genie is right but there is no Aladdin. It is not really a full 3D show as there are a lot of interactions in Japanese that I hardly understand so it was not really enjoyable. In fact, I found it to be a waste of time and the show was not short either :( After that it was already very late and we decided to go back. It was interesting as people were running around to maximise the remaining time for one last attraction. 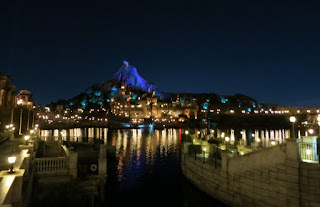 They inspired me to suggest that we chionged to the Nemo & Friends SeaRider which is considered one of the more popular attractions at Disneysea. We reached there almost 950pm and they still allowed people to go in. Great! Honestly I still find this quite kiddy and I wonder what the hype is. I took a lot of photos along the way back as it felt like spending an evening in Europe and that marked the end of the day. It is a sad realisation that not only tomorrow is the last day at Disney Resort, it is also the last day of this holiday. Evening scenery. Beautiful isn't it?